A chain of sub-glacial volcanoes erupt in Iceland. The melting ice floods the countryside. Poisonous gas descends on Scotland. A tsunami devastates the Norwegian coastline. An ash cloud rises into the atmosphere, blotting out the sun across Europe, ushering in a new Ice Age. Dozens of nuclear power plants, flooded by ocean water, experience meltdowns. Millions perish. Many more are displaced. All on the first day. 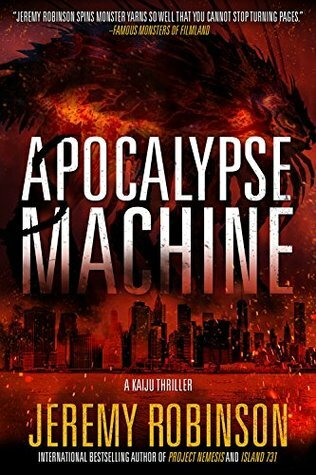 Jeremy Robinson returns to the Kaiju Thriller, but this time it’s different. The first half of the book feels like a lot of his previous books. The narrative switched between first person (Abraham Wright) and third person to describe world-wide events. Then, half-way through the story everything jumps forward 15 years. I wasn’t expecting that and it takes a few chapters before the story builds up steam again. Then character re-appear and the battle is on to save the world. Eventually things come together for a suitable exciting ending. This is more science- fiction than thriller, but yet again a great read.